Frederic Leighton was born in 1830 in Scarborough, in the North Riding of Yorkshire, but spent much of his childhood in contin­ental Europe, where he learnt several languages and went to school in Florence and Frankfurt. Leighton had many talents, of which painting proved the most profitable. He was technically capable, versatile (though primarily neoclas­sical) and hard working, though not an excep­tional innovator. Like many other successful artists, his greatest asset was what might now be called his marketing nous, and his home in Holland Park is the prime example of this talent. Built in 1864–6, when Leighton was still in his mid-30s, the house was designed by the architect George Aitchison, working under the artist’s close direction. With his paintings commanding four-figure sums from aspiring patrons of the arts – especially newly wealthy indus­tri­alists – and with family money behind him too, Leighton was able to expand and embellish this ‘private palace of art’ over the following three decades, creating a magni­ficent showcase for his work. The multi­fa­ceted exterior, with its red Suffolk brick and Caen stone dressings, is impressive but hardly awe-inspiring. Inside, however, his visitors’ senses were overwhelmed by decor­ative riches. 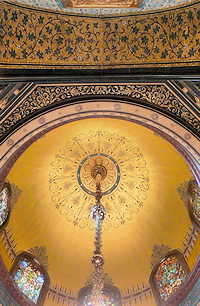 These reached their zenith in the golden dome, indoor fountain and medieval Turkish and Syrian ceramics of the Arab Hall, which was built in 1877. A year later Leighton was knighted and made president of the Royal Academy. The interior may have been to his own distinctive taste but its opulence was also a brilliant public relations exercise. He presided over regular Sunday recep­tions and musical soirées here, which were attended by everyone who was anyone in the world of the arts. Leighton, his home and his parties became the talk of London society and were lavishly featured in all the fashionable period­icals. Envious friends and rival artists were prompted to set up home close by, and some attempted their own exercises in osten­ta­tious interior design, though none matched Leighton’s excesses. A lifelong bachelor, Leighton seems to have had no private life at all and to have spent all his waking hours either working or enter­taining. 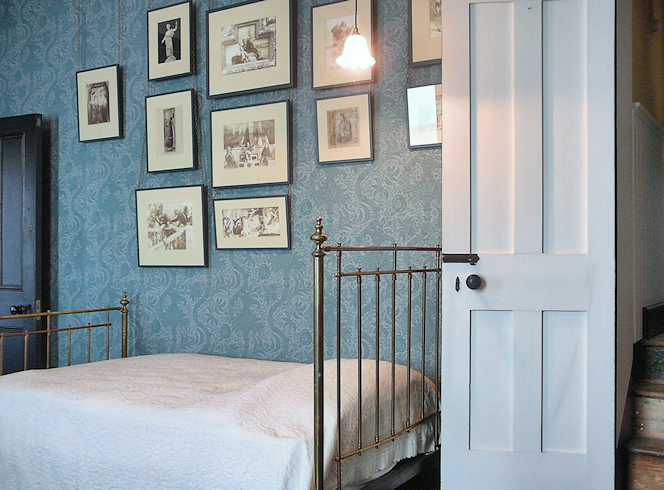 Unlike the house’s fabulous public areas, his bedroom (shown in the photo­graph below) was posit­ively austere, with a solitary electric lamp and a bed that was scarcely more luxurious than his butler’s in the basement. There was no guest room because none of his innumerable guests was ever invited to stay overnight. On his death in 1896, immedi­ately after he had been raised to the peerage, Leighton’s home passed to his twin sisters, who immedi­ately set about auctioning every item that wasn’t bolted down, and several that were, largely because the artist had made numerous generous bequests in his will that couldn’t otherwise have been funded. The house itself, with its sole upstairs bedroom, proved much harder to sell than its trappings and ended up in the possession of the Royal Borough of Kensington. To compound the loss of its contents, a series of well-meaning but ill-considered repairs over the course of the 20th century (including those neces­sitated by Second World War bomb damage) conspired to further disconnect the house from its original appearance. Almost all these wrongs were put right during a 17-month, £1.6 million refur­bishment programme that was completed in 2010. A team of researchers and craftspeople created facsimiles of the original fabrics, wallpapers and furniture. Even the electric lighting levels and colour temper­atures of 1896 have been replicated, though the brightness can be turned up when necessary. Some original paintings by Leighton and his Holland Park circle of friends have been repur­chased or loaned for display here. His lordship would be delighted if he could see the old place now. The quotation at the top of this article is taken from a letter written by William Michael Rossetti to his wife Lucy in 1882.